It is not everyday that we get to work with animals but it was a pleasure to be involved in this interesting project. One of our more creative customers worked closely with the architects of The Whittington Hospital NHS trust in London to produce this architectural figure. 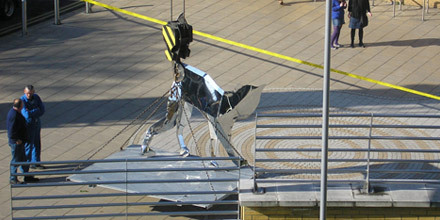 It was fabricated out of stainless steel and measure over 3 metres tall! We were responsible for applying a matt surface finish on the front face of the figure and ensuring that all weld and blemishes were removed from the surface. The back face was polished to a mirror finish.